A truck while over taking a school bus at Babu Basa between Devidanga and Milan More hits a cyclist and barges against an high intention electricity pole today morning at 8.30am. A mother with her kid were in the cycle, both injured have been rushed to hospital. Condition of kid is said to be serious. Truck driver says his breaks didn't work and the vehicle went out of control. To save the cyclist he had to hit the pole. 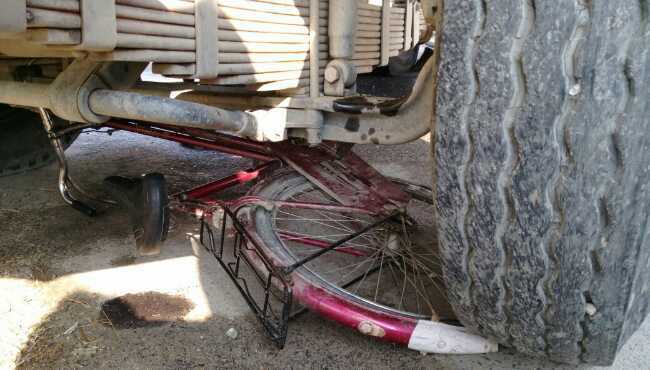 The cycle is stuck between the front wheels of the truck, fully crushed. Locals have blocked Devidanga Milan More road in protest that if the high tension wire had broken down, something big could have happened.